Jake Arrieta became the first Cubs pitcher since Carlos Zambrano to throw a No Hitter, and just the 14th No Hitter in the franchise's long history. Arrieta was on top of his game when he blanked the LA Dodgers in Dodger Stadium on Aug. 30, 2015. 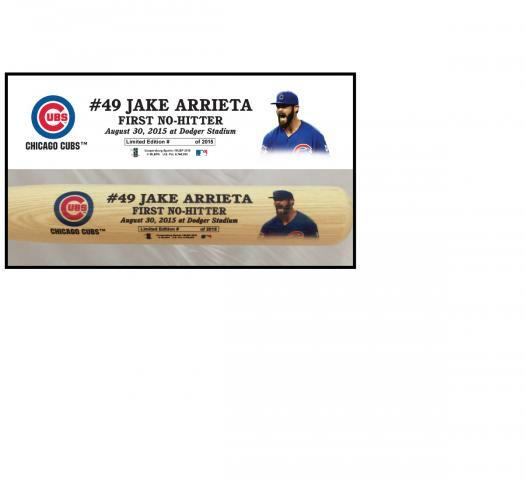 This full-size bat commemorates this historic event with Arrieta's image, Cubs logo and key stats from that memorable evening. Cubs fans across the country are celebrating the team's resurgence with performances like Arrieta's playing a key role in this winning season. This is a limited edition bat so order yours today.